The world of Tetris is wild in 2019. This is a game that so many have taken for granted over the years, despite how crucial it once was to video games. Tetris is a game that was so sought after and obviously important that it was the subject of a nasty rights battle, half of which was either an accident, weird Russian politics, or both. Even today, the rights to publishing Tetris is split up in so many weird ways, it’s impossible to keep track of it (unless it’s your job). But throughout the most recent console “generaton,” what Tetris even is has been disrupted in dramatic fashion. While before you had occasional new ports with a bonus, gimmicky mode or two, right now there are at least four distinct version of Tetris playable on current hardware. The best thing about that is, with one glaring exception, all of them are absolutely worth playing. Fair warning: While I’m not above doing platform gymnastics to keep things in the family, so to speak, we’re going to leave the PlayStation bubble a little bit during this article. That said, there is plenty of PlayStation-adjacent Tetris fun to be had here. From a seriously wacky party game to one of the most surprisingly emotional experiences you can have with a video game today, playing Tetris on PlayStation platforms has never been better. Seriously, there is surprisingly little quality Tetris happening until, well, 2018. This is a game that’s super multiplatform, but hey, it still counts. Puyo Puyo Tetris, for a long time, was one of those weird Japanese games only nerds willing to shell out the import cash actually played. However, several years after its initial 2014 release, Sega finally used the Nintendo Switch (and, ostensibly, an Ubisoft mistake) as an excuse to get this game to North America. The PlayStation 4 version came along for the ride. This is not your usual Tetris game. You can use it to just play Tetris, but that’s a party foul. 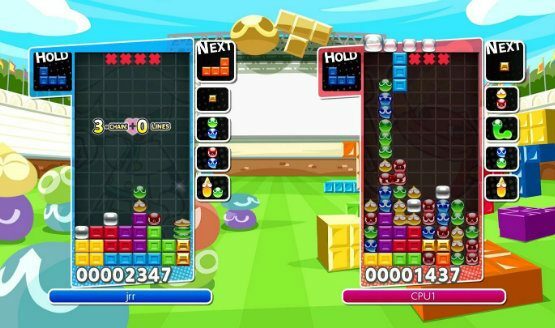 Puyo Puyo Tetris is as self-explanatory as it gets; the gameplay has various combinations of Tetris and Puyo Puyo, a puzzle game with a drastically different core concept. You can play either/or, play one against the other, or play a mode that swaps between the two in set intervals with up to four players. It’s an excellent party game for people who just enjoy being confused and can totally be an intense test of skill when you pit a serious Tetris player against a Puyo Puyo champion. On top of all that is an extremely wacky story mode you have to play to believe. Imagine playing Tetris in VR. It probably sounds alright, but now imagine playing Tetris in VR while everything about the game outside of its core mechanics is designed to completely overwhelm your visual/aural senses. 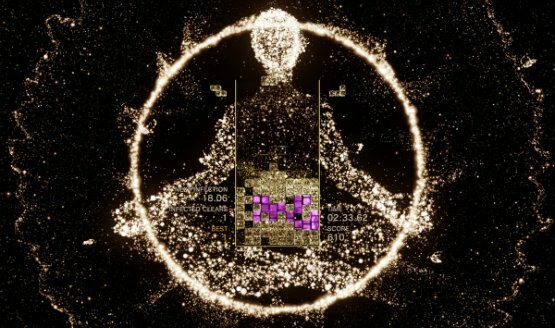 Tetris Effect, a title produced by Tetsuya Mizuguchi of Rez and Lumines fame, will catch you off guard. You’ll sit down to play some Tetris, then five minutes later be on the verge of tears as a family of space whales and manta rays splashes along to a beautiful song about being in love and stuff. A couple stages later, you’ll be almost terrified by a drum circle made of literal fire. Then, by the end, you’ll have transcended humanity entirely and discarded your sense of being in favor of the Tetris Effect instrumentality. Finally, you take the PSVR headset off, your eyes do that wavy, standing motion thing, and you’ll never be able to truly cope with the experience you just had. Yes, we’re still talking about a Tetris game. Time for a breather. Here’s the Ubisoft mistake I was talking about earlier. For a while, Electronic Arts seemed to have the majority rights to Tetris, publishing fairly bare-bones versions on mobile platforms, the PSP, and so on. There were some browser games as well, but nothing of real note. Then Ubisoft surprised everyone by snapping up the rights and revealing Tetris Ultimate, which was supposed to be the one Tetris to rule them all. Sadly, it wasn’t. It was a little too clean and sterile, with multiplayer modes that didn’t do anything Nintendo did better in the past. It was also glitchy to a fault and committed a serious war crime in forcing Nintendo to delist its classic Virtual Console editions. Tetris Ultimate is no longer available for purchase, and that delisting seemed to be the kickoff point for all the fun that followed. We can’t talk about Tetris in (insert Current Year) and stick to PlayStation. It’s important to bundle all of these things together, as they’re all equally timely and drastically different in terms of gameplay, which is something that almost never happens. Frankly, to get back to this kind of variety and experimentation, you’d have to go all the way back to when creator Alexey Pajitnov was attempting to make “Tris” a series thing, and that didn’t work out. 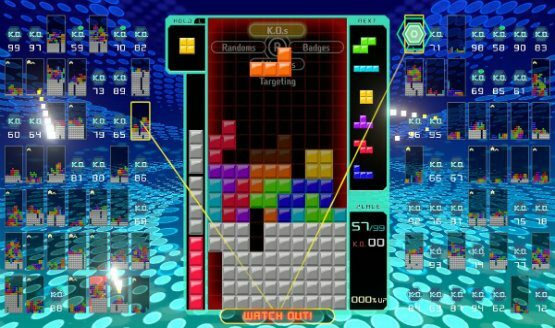 This is far from a novelty or even variety thing—each version of Tetris feels distinct and uniquely valuable right now, and expanding to these other platforms here is crucial. These are the oldest games we’re looking at here, because having a game designed for mobile platforms that still run on iOS hardware today means they’re still being used and supported. In 2013, Electronic Arts more or less rebranded its Tetris with an updated “core” game and a new idea called Tetris Bliss. While EA’s Tetris is pretty bare bones, it does innovate when it comes to controlling this time-ignoring classic with touch screens. You tap to rotate your piece, directly tap the Hold space to set a piece aside, and more importantly, swipe down to hard drop. 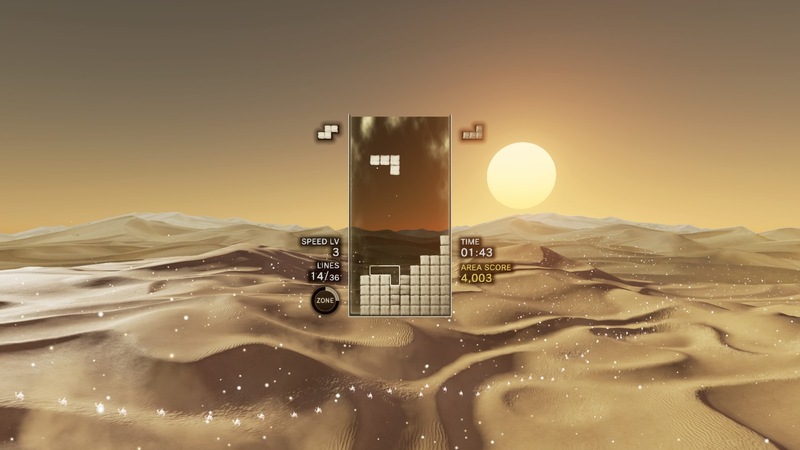 This creates an inherent need for that drop preview present in many modern Tetris titles, making it a key part of the gameplay. This is only strengthened in an alternate control mode that attempts to let players bypass the rotation and let the game automate the ideal spots for each piece. Thus, you have easy Tetris play on your phone with one hand. 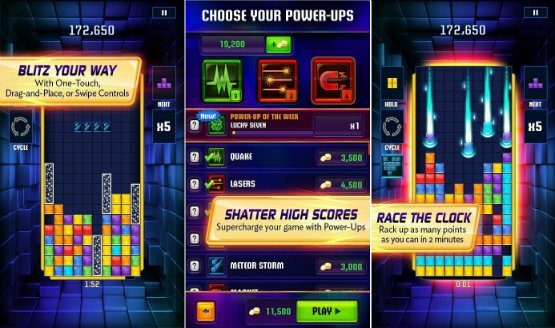 Tetris Blitz takes that and turns it into a competition between players that fits right in with other competitive puzzlers in the mobile gaming space. You get two minutes to rack up as many points as possible, with several twists. You can spend coins on wacky power-ups, and each round starts with blocks already on the board. Also, clearing lines causes extra blocks to fall down into empty slots, making chain combos a thing in Tetris. This makes for a new sort of Tetris experience that still looks familiar, but chases a different kind of goal. 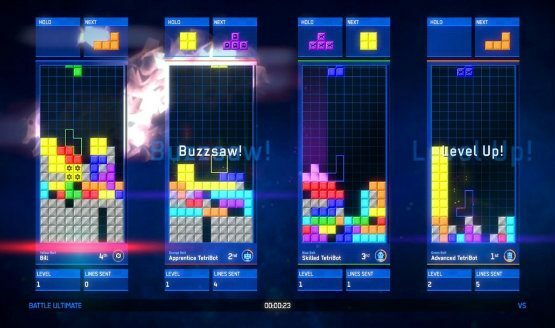 Less than a year after we thought Tetris Effect utterly changed the game, Nintendo went and stealth-dropped Tetris 99. As the title suggests, this game, developed by trusted hand Arika, is literally a Tetris battle royale game ala Fortnite or Apex Legends. Unfortunately, this is a Nintendo-published game, meaning you won’t be seeing it on a PlayStation platform any time soon. But it’s a magnificent game, taking the familiar Tetris gameplay, not changing it much at all, but inserting it into a space that makes it the most stressful Tetris has ever been. It’s basically the polar opposite of Tetris Effect in tone. But as stressful as it can be, there’s nothing like getting that chicken dinner. Since 2017, we have seen the very face of Tetris changed forever. In fact, that face was split into separate entities, each one stranger than the last. But, these oddities are all their own, each presenting a new way to play Tetris, with confidence and polish we’ve never seen before. We can’t forget that Tetris changed the world back in 1989 as a Game Boy pack-in title. Fading away into the background as a budget-friendly IP cash-in on consoles for so long was a great disservice to such a key part of gaming history. Now, it feels like we’re making up for lost time. Tetris Ultimate did have to kind of die to help make this all happen, so if nothing else Ubisoft will be remembered for its brave sacrifice. It’s hard to imagine what the next, new Tetris experience could be, but it’s comforting to see so much creative energy, even in budget-friendly spaces.